The Lantern Theatre/Conway Community Arts Association presents “God of Carnage” at the South Arkansas Arts Center on Saturday, March 14. Jack Wilson, Arkansas Community Theatre Association President, said, ““Come to the South Arkansas Arts Center and support CCAA as they prepare to head to New Mexico to represent Arkansas in the American Association of Community Theatre Region VI festival. This will be a great opportunity to see quality theatre from another community presented right here on the SAAC stage and for the actors from Conway to feel the warmth of the El Dorado audience.” Wilson is also the executive director of the South Arkansas Arts Center. “God of Carnage” takes place in the living room of Veronica and Michael. A playground altercation between their 11-year-old son and another 11-year-old boy brings together two sets of Brooklyn parents for a meeting to resolve the matter in a civilized manner. At first, diplomatic niceties are observed, but as the meeting progresses, and the rum flows, tensions emerge and the gloves come off, leaving the couples with more than just their principles in tatters. The 2009 Broadway production featured Jeff Daniels, Hope Davis, James Gandolfini and Marcia Gay Harden. All four actors received Tony nominations for their portrayals with Ms. Harden winning the Tony for Best Leading Actress. The performance does contain adult language. The performance will take place in competition form, giving the audience a chance to see a ten minute (or less) stage set up, a one hour (or less) performance, and a ten minute (or less) stage strike. 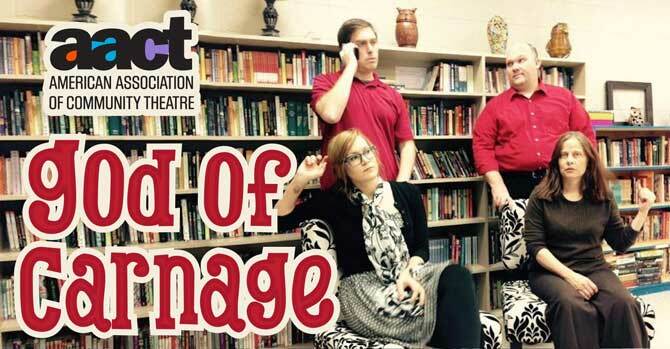 “God of Carnage” will start at 8:30pm on Saturday, March 14. The cast party will begin immediately after the stage strike (approximately 9:30pm). Tickets are $15 (open seating) and include the party. All proceeds will go to CCAA to help fund their trip to AACTFest regional competition in Albuquerque.